This looks like a big project but can be done in stages over a number of days. 1. Place the granulated sugar and dark brown sugar, margarine, golden syrup & milk into a saucepan and heat gently, stirring mixture constantly, until the granulated sugar, dark brown sugar and margarine have melted and the mixture is smooth. Be careful not to overheat. Pour into a large bowl. 2. Sieve flour, baking soda, cinnamon, and ginger together. Stir into the wet mixture. To speed it up use an electric mixer. 3. Line a 10” square tin with baking parchment and pour in the dough. Smooth dough, cover with cling film or another sheet of baking parchment and leave for 8 hours or overnight in a cool place. Don’t place the dough in the fridge as it will be really difficult to roll out. 4. Cut out templates for the ginger bread house on paper first, then trace and copy on cardboard. An old cereal box is perfect. You will need 2 templates for the front of the house, one for the side and one for the roof. Depending on how many trays you have it might be easier to roll out and bake the gingerbread in sections. Once baked and completely cold either place in an airtight container or wrap in cling film. You will need to roll out and bake 2 sides for the house, 2 for the roof and 2 for the front and back of the house. 5. Cut out two windows on each side of the house and one window at the front of the house. 6. Turn the dough out onto a work surface. Divide the dough into 6 equal portions. Use a little flour and roll out one portion of the dough to about ½” thickness. This is much easier if rolled out onto a sheet of baking paper. Make sure before rolling you cut out the baking paper to fit a baking tray and that one of the templates for the ginger bread house fits on it. Put one of the cardboard templates on top of the rolled out dough and cut around the shape. Place the baking paper with the gingerbread on a baking tray. Refrigerate for 1 hour until the ginger bread is firm. Roll all the gingerbread scraps left over together and wrap in cling film. Keep the excess gingerbread dough for making extra decorations for the gingerbread house. 7. Bake the gingerbread at 180oC / gas mark 4 for 25 to 30 minutes until it is dark brown and firm to the touch. Make sure that the large pieces are baked all the way through. You will need to cook the gingerbread house in stages. It is best to place one piece of the house on to one baking tray at a time as the gingerbread will expand during cooking. 8. When the gingerbread is nearly cooked removed from the oven, place the template on the cooked gingerbread and carefully cut around it to trim to the exact size and shape. It is important to do this so the house will fit together and while the gingerbread is warm. Once it hardens it is more likely to break if cut then. Return the gingerbread to the oven for five more minutes. Then remove and place on a wire tray and allow to cool. 1. Draw a rough outline of the house on a very large tray, cake board or piece of wood. This will show exactly where the house will be attached. 2. Next make the instant royal icing by following the instructions on the packet until it is stiff. Cover with cling film or a damp clean cloth to prevent it from dry out. 3. Fill a piping bag with some instant royal icing or use a pallet knife to spread a generous amount of royal icing along the edges of the house. Now spread royal icing where the house will stand. Pipe the royal icing along the edge of each piece of the house. Stick one side of the house down onto the icing. Attach the front of the house to the side and then the other side to the back. Pipe some more royal icing along the inside and outside of the gingerbread house where all the edges meet to ensure they are well stuck together. Inside the house where the windows are use a little instant royal icing to stick the gelatine sheets it give a window glass effect. 4. Then pipe along the edges of the gingerbread house where the roof will attach and stick it on. Now carefully place one side of the roof and then the second. Fill in any gaps with Instant Royal Icing. 5. Colour one packet of Roll Out Icing with red food colouring. Sprinkle some Icing sugar onto a work surface. Roll out half of the red icing and half the plain white roll out icing. Spread a thin layer of instant royal icing on the 2 roof pieces and place a row of the red tiles then a row of white along both sides of the roof. 6. Roll the remaining red and white roll out icing into two long thin sausage shapes. Then twist both colours together. Pipe more instant royal icing around the edges house and stick the red and whites twists to it. 7. Fill a small piping bag with roll out icing and pipe around the gelatine sheets to make windows and around the overhang of the roof for an icicle effect. 8. 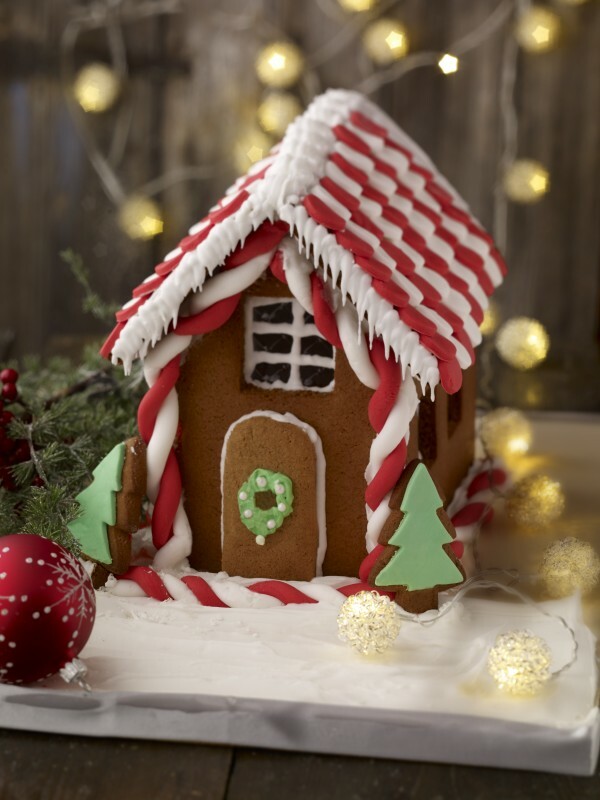 Use any leftover gingerbread dough to make a door, Christmas trees, fence and snowmen to decorate the house it. – If you don’t like ginger or cinnamon flavour the house with vanilla extract or cocoa powder. – For a hidden surprise fill the inside of the house with sweets. – To thin icing slightly for icicles just add a little warm water to the royal icing and pipe it around the edges of the roof. – If there is any gingerbread dough left over cut out star, snowflake, Christmas tree and stocking. Tie with some string to hang on the Christmas tree. Hailing from Dundrum, Louise always had an interest in food. 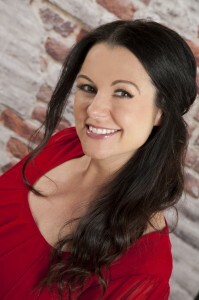 For 3 years Louise studied professional cookery at Cathal Brugha Street. There she discovered her natural flair for pastry work and quickly moved to a prime job in Mahers in Dublin 4. Two years later, aged just 22, she became Head Pastry Chef at the renowned Dobbins Restaurant under the ownership of the late John O’Byrne. It was here that Louise honed her skills in the art of the plated dessert, and where her creations in edible art, such as sugar skills and chocolate work, were recognised. Nowadays you will find Louise, the self-employed pastry chef, selling her breads, biscuits and cakes in the Cup Cake Cottage in Airfield in Dundrum. She also sets aside time to give cookery lessons to children, a job she particularly loves. For more information on Louise follow her on Facebook and Twitter, or visit her www.louiselennox.com.